Birthday is an ELK Studios game that’s borrowing characters from many of their previous slot machines, and it’s obviously inspired by a birthday party. ELK Studios, through Birthday, appears to be celebrating a number of years since they started working on slot machines. They do it by bringing inside a bar many of the characters that we’ve previously seen in slots of theirs. From the bull that appeared in El Torro, to Electric Sam, trolls, Mr. Elk, Anne Bonny or the Matador, you have quite a few beloved characters making appearances here. The location is in a bar obviously, and the bull is the bartender. Besides the characters, many of which will be feature triggers, the slot will also have its logos, red roses, cocktails and balloons in different colors and shapes. A good-looking slot machine obviously, as ELK Studios has always done well by their players. In Birthday, you have 178 lines over 5 reels. Top wins of up to $250,000 are apparently a possibility inside, in this slot which promises an RTP of 96.3%. Among its many features, you get the wild, happy spins, Camel respins with guaranteed wins, Mr Lake respins with 5-symbol guaranteed wins, collectable symbols, big wins, free spins, walking wilds and sticky wilds. As you play Birthday, you need to do so with a wager that covers all 178 ways to win. You pick a value between $0.10 and $50 to use, and you don’t have to worry about individual line bets. All the features available in Birthday are delivered at random, so you don’t trigger them via in-game symbols. That’s a downside for me, since it takes away from you at least the illusion of control, or that your luck is still involved somehow. The guests at the birthday party each bring their own features when they are triggered. You might get wild symbols, free spins or respins. You can combine the Happy spins with wilds and free spins. The Happy Spins are respins, which will continue until something happens. For Mr. Camel, the respins will go on until you get 3 to 5 wins. Mr Lake does the same, until you have a combo of 5 symbols form. Electric Sam allows you to collect symbols and pays you based on their total number. Anne Bonny gives you a big win (20x bet). Matador collects wins with certain selected symbols. Maggie has 10 free spins. Walking Wilds and Sticky Wilds are also triggered, at random, one at any time and the other during Happy or free spins. 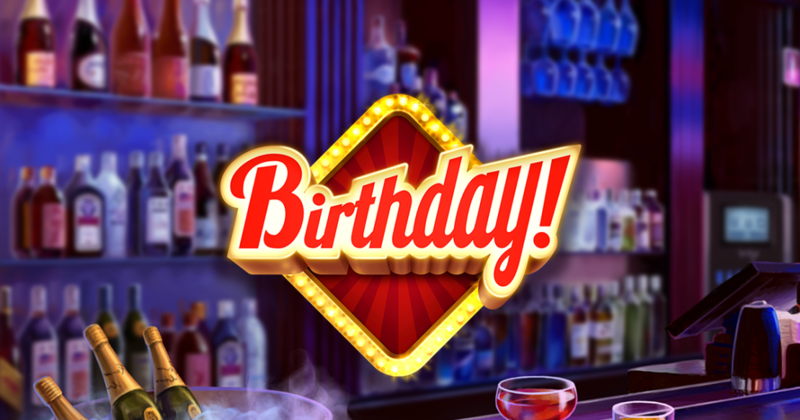 There is a lot that is being offered in Birthday, a slot machine that ELK Studios crammed full with random features. It’s too bad that they didn’t use regular ones as well. Try of out a demo version of Birthday.